What is the NOT Function? The NOT function is a Logical function. 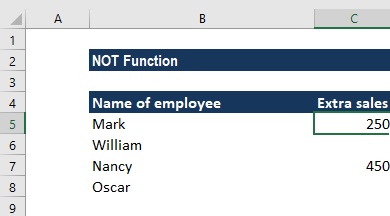 The function helps check if one value is not equal to another. If we give TRUE, it will return FALSE and when given FALSE, it will return TRUE. So, basically, it will return a reverse logical value. As a financial analystFinancial Analyst Job DescriptionSee a real Financial Analyst Job Description including all the skills, experience, and education required to be the successful candidate for the job. Perform financial forecasting, reporting, and operational metrics tracking, analyze financial data, create financial models, the NOT function is useful when we wish to know when a specific condition was not met. Logical (required argument) – The argument should be a logical or numerical value. If the given logical argument is a numeric value, zero is treated as the logical value FALSE and any other numeric value is treated as the logical value TRUE. 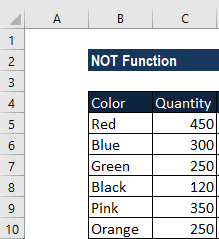 How to use the NOT Function in Excel? To avoid the Red Blue combination, we will use the formula =NOT(C6=”Red Blue”). If we wish to test several conditions in a single formula, then we can use NOT in conjunction with the AND or OR function. For example, if we wanted to exclude Red Blue and slate black, the formula would be =NOT(OR(C2=”Slate black”, C2=”Red Blue”). Suppose we need to put no increase for employees. Basically, we wish to reverse the behavior of some other functions. For instance, we can combine NOT and ISBLANK functions to create the ISNOTBLANK formula. If the cell C5 is not empty, multiply the extra sales in C5 by 0.25, which gives the 25% bonus to each salesman who has made any extra sales. If there are no extra sales that is C5 is blank, then the text “No bonus” appears. 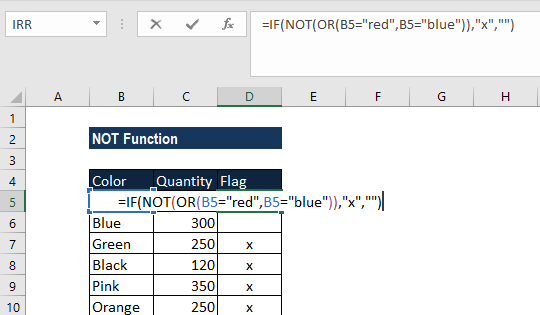 In essence, this is how we use Logical functions in Excel. We can use it with AND, XOR, OR and NOT. Let’s say we wish to highlight a cell that doesn’t meet specific criteria. In such scenario, we can use NOT with IF and OR function. Suppose we received an order to manufacture soft toys of Red and Blue color. The colors are specified by the client and we can’t change them. Here, we marked inventory that was not of specific colors, that is, which were not Red or Blue. 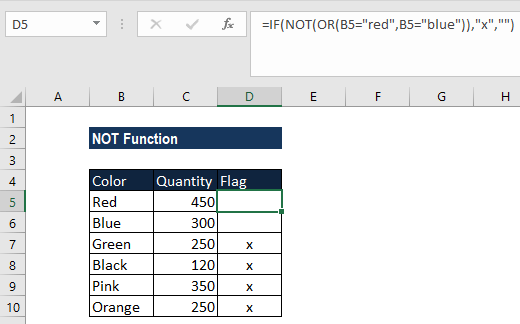 Using NOT and OR, we will get TRUE if the specified cell is not Red or Blue. We added an empty string “” so if the result is FALSE, we get X and nothing if TRUE. We can expand OR to add additional conditions if required. #VALUE! error – Occurs when the given argument is not a logical value or numeric value.